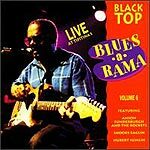 CD review: "Black Top Blues-A-Rama, Vol. 6"
This review first appeared in the May 1, 1992 edition of the North County Blade-Citizen (now North County Times). The latest installment in Black Top's live recordings from Tipitina's in New Orleans is aimed at guitar fans, featuring as it does Anson Funderburgh and the Rockets, Snooks Eaglin and Hubert Sumlin, from Texas, New Orleans and Chicago, respectively. Perhaps no white guitarist this side of Johnny Winter or the late Stevie Ray Vaughan has such a feel for the blues as Anson Funderburgh. Like his fellow Texans, he places more emphasis on playing the right note than on playing the most. And if he can't sing as well as they, that's all right, too: He doesn't try. Veteran bluesman Sam Myers fills that role, and plays a mean harmonica to boot. Eaglin is the most undeservedly unknown guitarist around. He laid down some of the best acoustic guitar blues out of the Crescent City on the Arhoolie label in the late'50s, gigged with Professor Longhair in the '70s, and has released several excellent studio albums on Black Top over the last decade. On this set, he is up to his usual standards, and lays down some funky, syncopated lines that scream "New Orleans." Sumlin, the former Muddy Waters sideman, is from the Chicago school of the blues. His performance here is indicative of his history, with an uptempo set of heavy, pulsating blues that speaks to the past without sounding dated. As an introduction to any of the three artists above, this would be a strong album. With the combination of them all, it is excellent.